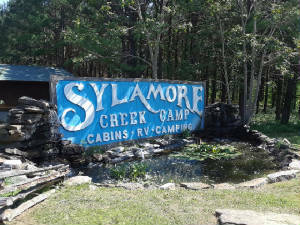 Welcome to Sylamore Creek Camp. We'll do everything we can to make sure your stay is an enjoyable one. After all, you're the reason we're here! See also additional page links at the bottom of each page for Maps, coming events, etc. Please check out our videos at the bottom of the page. 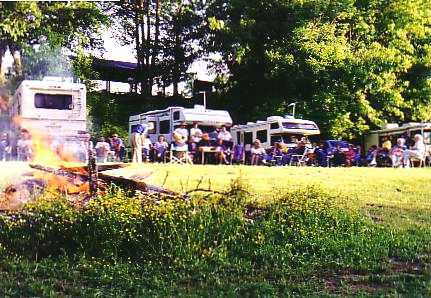 If you're looking for campsites, RV sites or a comfortable cabin getaway, we have what you're looking for! 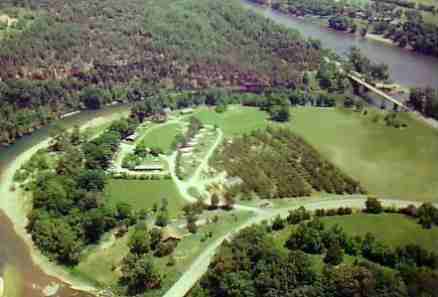 We're located right on the banks of the Sylamore Creek with the tall bluffs of the Ozark National Forest on the other side. 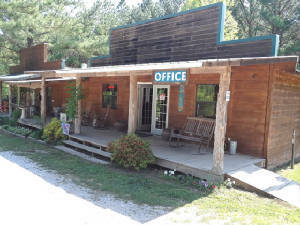 Just 5 miles north of Mountain View, & 7 miles from Blanchard Springs Cavern, we couldn't be better situated. With a sports field and open air pavilion plus an indoor Recreation Room with a ping-pong and pool table, couch, chairs and big screen TV, as well as an Exercise Room, it's a great place for family reunions. Enjoy swimming and fishing in the Sylamore Creek. The White River is just a few hundred yards downstream. There is a public boat ramp at the mouth of the creek. 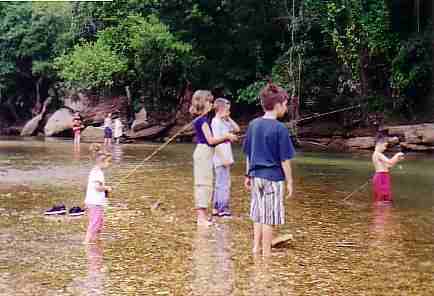 From there, you can fish for trout in the river, or motor back up the creek to our campground, where you can anchor along the shore. If you don't have a boat, you can rent one, with a guide if you want, from two nearby boat docks. Visit our new office and campstore just inside the entrance. Enjoy the inviting front porch with rocking chairs & picnic table. Inside, hand hewn beams with a field stone fireplace & antique display cases set the tone for the solid quality and friendly atmosphere you'll find throughout the campground. For your convienence we carry fishing tackle, bait, camp supplies, cold drinks & ice, as well as many other interesting and unusual items. The kids will enjoy the large aquarium with various creek critters as well as the numerous Native American artifacts found here, which was, in years past, the site of an Indian village. As you can see from the smiles on the faces of these boys & their Grandfather, they've enjoyed a memorable time! 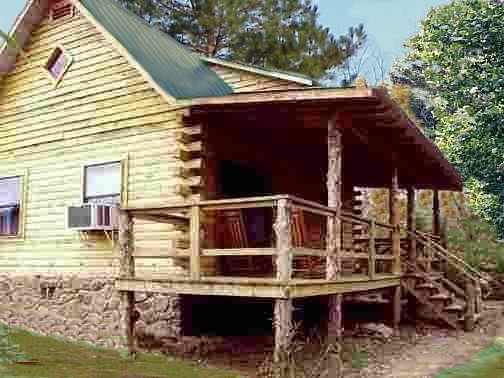 If you're looking for the comfort of a spacious, fully furnished cabin right down by the water, you'll love these! If it's just for two, or the whole family, there are different cabin sizes to suit your needs. Click on the Cabin page to see more! This is what I call good clean fun! Looking for a friendly place to park your RV? Tired of those cramped RV parking lots where you're squeezed in so tight that you don't even have room to extend your slide-out without feeling like you're in the next person's living room? Give us a try, click on the RV page for more info. I'll treat you right!